McBride’s RV Storage includes (two) modern, easy-to-use dump stations for dumping and rinsing your holding tanks. Both stations are custom designed for RV users in mind. ?The dump station facilities are located in an easy to use covered amenities area. This covered area provides protection to the RV user from the summer’s heat and the winter’s rain. With maneuverability in mind, the station was designed as pull through, making the job so much easier. The floor of the dump station is concrete and tilted towards the drain, guaranteeing a complete clean out of your tanks every time you use them. Another customer feature is the swish and flush pedals that assure a clean and smell free environment. This makes the worst and most unpleasant job for most RV’ers, a simple, easy and sanitary experience. 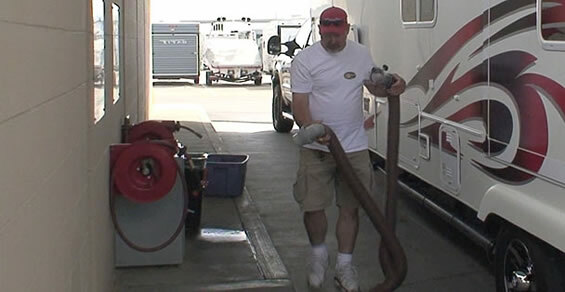 Customers also enjoy the additional hoses provided for vehicles with tank washing/flushing connections. These modern dump stations make RV’ing far more enjoyable. Customers no longer have to endure a smelly and unsanitary, public dump site that diminishes the RV experience. McBride´s RV Storage offers affordable options for all vehicles that need storage. Here you get the RV & boat storage experience that you want and need. Over 3000 RV owners like you have chosen McBride´s as their first choice for their vehicle storage needs. Now you can get more and pay less for convenience, comfort, security and affordability that you would expect from the ultimate RV storage facility.